House Clearance Service In All Areas Harrington Kendal Keswick Kirkby Silloth Ulverston Whitehaven Wigton Windermere. 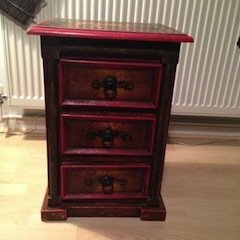 A small vintage style solid wood chest of drawers, hand painted red with a rustic effect, having three drawers with cast iron handles. A tall standing silver Beko double door fridge freezer, with built in water and ice dispenser. 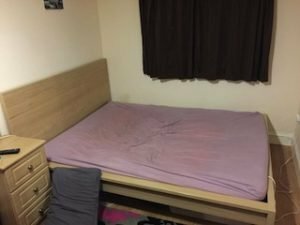 A solid pine double bed frame and matching bedside chest of drawers, together with a double mattress. 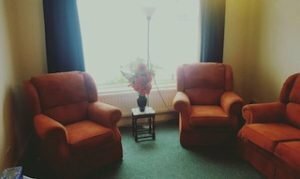 A three piece sofa suite, to include a three seater high back sofa and two matching armchairs, all upholstered in burnt orange fabric. A space grey and stainless steel Hotpoint Futura under counter dishwasher. 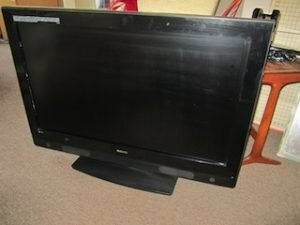 A black Beko 37 inch flat screen HD television. 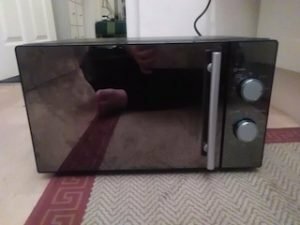 A brand new boxed russell hobbs black and stainless steel four slice toaster, together with the matching kettle. 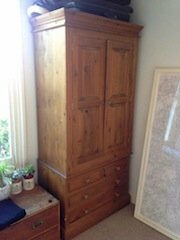 A two piece rustic style solid pine double wardrobe, having two small drawers over tow large drawers. 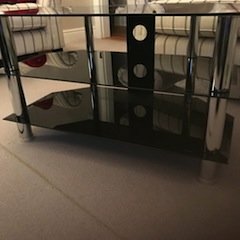 A black glass and chrome three tiered television unit. 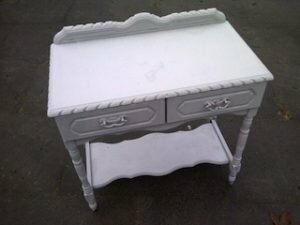 A hand painted white solid wood console table in the shabby chic style, having two drawers and a shelving area. 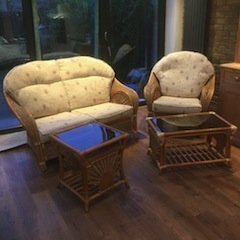 A four piece cane conservatory furniture suite, to include a two seater high back sofa, an armchair, a glass topped side table and a glass topped coffee table. 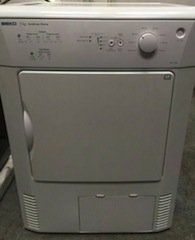 A white Beko 7kg under counter condenser tumble dryer. 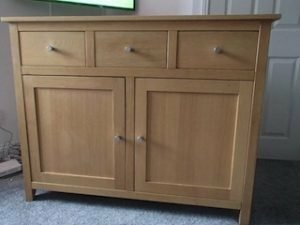 A large solid pine sideboard with chrome knobs, having three equal sized storage drawers above a double cupboard. 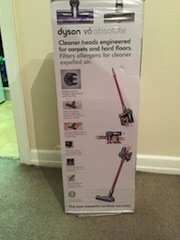 A brand new boxed pink and space grey, Dyson V6 Absolute handheld vacuum cleaner. 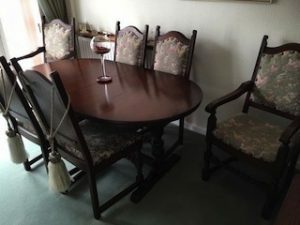 A vintage style extendable mahogany oval dining table, together with six matching high back dining chairs, upholstered to the seats and backrests in a heavy floral patterned fabric, with iron stud detailing to the edges.